Pokemon Go has taken the world by storm without a Doubt. Though the game is launched in selected Countries like the US, New Zealand, etc., People from other countries are also able to play it with some efforts. In the Meantime, users are getting "Failed to get player information from the server" error while trying to play. This Error Don't allow users to go further and start playing. Pokemon Go is already a Hit and will be launched in More countries soon. The Game Requires you to have GPS on and 3g Connection. You just don't require a Data connection, but a Good and Fast Connection too. After all, it all comes to GPS to track your Location. Today we are talking about Failed to get Player Information in Pokemon Go, Which users are getting while playing Pokemon go game on their Smarphone. We are here to provide you with Solution to the error, and you are here because you are a victim of this very error. But Worry no more and keep reading. There are two methods that we are going to share in this post. We generally provide more then 2 ways to fix a particular error and today is no change. So lets get straight to the point and see how to fix failed to get Players information error in Pokemon go app. Both the solutions will work for Android and IOS Users. IOS Users: Go to Settings > Privacy, Then Location Services. Now Toggle Pokemon Go Off and On again. Android Users: Open Settings > Apps/Apps Management, Scroll down to find Pokemon Go and tap on it. Now Click on Force Close and also Clear Cache. Now just Reboot your phone. That is it. Go ahead and Open the app now, This time you should not see failed to get Player Information from the server Error message. Method 2: Using Airplane Mode. I tried this method myself on my buddy's phone, and it worked. So to save your time I am listing this method first. It is easy and will not take more than a couple of minutes. Follow below-mentioned steps. Step 1: Close Pokemon Go app on your phone. Step 2: Put your phone on Airplane Mode. Fastest way to do it is by Sliding down from the top of your screen. This will open Notification panel, and that is where you will see a Aeroplane mode icon. Just tap on it. OR for iPhone, you can simply go to Settings. Step 3: Now Open Pokemon Go app. You will see Niantic Logo, Next screen will be Loading bar. Step 4: The Game will not Load, and soon you will see No Internet Connectivity on top of your screen. Just then, Take your phone out of Airplane Mode. Step 5: After turning off Airplane Mode, You will see Loading bar filling and within seconds, it will be ready to play. This is a very odd fix to Failed to get player information from the server error message. But It works for a lot of users. Airplane mode just stops Bluetooth, Wifi, GPS and Cellular Networks. If you do every step Correctly, then you must have fixed the error by now, and you don't need to check Method #3 below. Method 3: Reinstall Pokemon Go. In most cases, above methods should work. But if it doesn't work for you, then do not worry because Reinstalling Pokemon go app is another way to fix Failed to get Player information from the server issue. Uninstall Pokemon Go app from the front screen or go to Settings > App Management > Pokemon Go > Uninstall. Download and Install Pokemon Go again from Playstore. You might get the same error again but if nothing helps then you have to keep Reinstalling the app again and again every time. This Error must get fixed if it's from the server side issue. Obviously, their servers must be overloaded and so the error messages like this one may pop up times and times again. So that is it. We hope that by now you must have fixed Failed to get player information from the server error, and you must be busy again catching your favorite Pokemon. Enjoy the game because you gotta catch' em all. I can log into any account on my phone, but my personal account. Hi Alexander, Can you please elaborate a bit more. 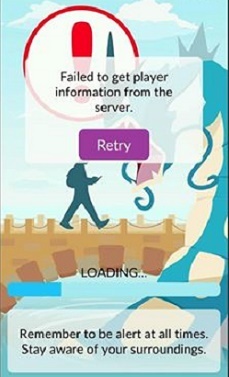 Is your comment regarding this post Failed to get information from the server error in Pokemon Go or some else? hello ALEXANDER & ALAA AHMAD, Have you tried Method 1: Using Airplane mode ? In most cases, this should fix the problem. Tried all 3 methods, none of them work. HI, i see that all the above methods have failed. I would suggest you to Remove your Google account > Reboot your phone < Re-add the same Google Account. You can do this by going to settings > Accounts > Google > Remove this Account. See if this helps and Please Report back your Results.